Card game lovers across the globe have been relishing rummy, a card game of skills for probably a couple of centuries now. People love to play the game in social get-togethers and clubs, while shuttling to and from their workplaces in trains and at festivals. It offers copious doses of entertainment and wonderful adrenaline rush to the players. Moreover, as rummy is a game of skills, indulging in the game helps you to improve your cognitive and observation skills, decision making abilities and gain a hold over mathematical concepts of permutations, combinations and probability etc. 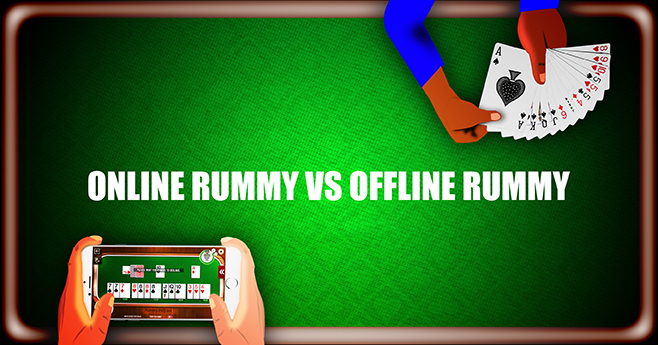 When we talk about Online Rummy, it is a vibrant tech savvy version of the traditional game. Now, let us see how do the two differ. For enjoying the offline game, you need a deck of cards and fellow players, as also a place where you can comfortably play. As mentioned above, it is generally enjoyed by the masses in social gatherings, during long distance journeys with family or friends and in clubs. To play the Online Rummy game, you require a smart gadget such as a computer, tablet or smartphone, and a 4G or at least a 3G internet connection. However, there is no need to look for people with whom you can play. The online platform is always abuzz with activity due to 24 * 7 presence of players. Mobile, with an internet connection, is an indispensable part of today’s life. The same small gadget can help you access the game of web rummy anywhere and at any time. In the face to face game, courtesies demand that you do not keep other players waiting. Still, some players tend to take the liberty of taking a bit more time in making their moves. However, when you play the online game, you get only a few seconds to contemplate and make your moves. This propels you to start thinking fast and acting fast. In other words, playing online rummy gives you an added advantage that you become deft at responding to real-time situations in the game as also life. In the physical game, bluffing on the part of players plays a crucial role. In fact, it is a clever trick deployed by bluff masters to propel their opponents to drop out of the game. They pretend that they have a very good hand by constantly shuffling their cards into groups and grinning from ear to ear. Needless to say, many a time they are able to turn the tide in their favour. It is a dominant aspect of the offline version. However, its manifestation in the online game is bare minimum, as you can see neither your opponents nor how they are shuffling their cards. You can only see the cards discarded by them and those picked by them from the open pile. There is a feature of Live chat but players do not normally make use of it. The offline game is generally played among kith and kin at the time of family gatherings, functions and festivals to have fun and spend quality time together. It is not a routine affair and may or may not involve money. On the contrary, at most rummy portals, there are games and Tournaments along with incredible promotions on a routine basis. There are very low as also high-value tables. Players can make the most of them and doyens of the game can win big money too. Technological advancements in various fields have been making our tasks simpler and more interesting. Online Rummy is one of the many boons of this phenomenon. However, whether offline or online, rummy is a superb means of entertainment, helps you bid adieu to stress, makes you imbibe a number of life skills such as patience, watchfulness and wisdom, and also helps you learn a number of mathematical principles. You can indulge in the physical game when you have kin and kith around, and want to make merry with them; and enjoy online rummy when you are alone or on the go!